The Nigerian courts of appeals are the intermediate appellate courts of the Nigerian federal court system. The court of appeals decides appeals from the district courts within the federal judicial system, and in some instances from other designated federal courts and administrative agencies. As at 2010, there are 66 judges of the Nigerian courts of appeals authorized by the Senate. These judges are recommended by the National Judicial Council, nominated by the President of Nigeria and confirmed by the Senate. There are currently seventy-two Nigerian courts of appeals across the six geopolitical zones of Nigeria. There are 12 North-Central, 10 in Northeast, 10 in Northwest, 10 in South-south, 9 in Southeast and 11 in Southwestern Nigeria. The headquarter is located at Three Arms Zone, Abuja. The Supreme Court of Nigeria (SCN), is the highest court in Nigeria, and is located in the Central District, Abuja, in what is known as the Three Arms Zone, so called due to the proximity of the offices of the Presidential Complex, the National Assembly, and the Supreme Court. The National Judicial Council (NJC), is an executive body established by the Federal Government of Nigeria in accordance with the provisions of Section 153 of the 1999 Constitution as amended to protect the Judiciary of Nigeria from the whims and caprices of the Executive. The President of the Federal Republic of Nigeria is the head of state and head of government of the Federal Republic of Nigeria. The President of Nigeria is also the commander-in-chief of the Nigerian Armed Forces. The President is elected in national elections which take place every four years. The first President of Nigeria was Nnamdi Azikiwe, who took office on October 1, 1963. The current President, Muhammadu Buhari took office on May 29, 2015 as the 15th President of the Federal Republic of Nigeria. The Lagos State Governor is the head of Lagos State Government. The governor leads the executive branch of the Lagos State Government. This position places its holder in leadership of the state with command authority over the state affairs. The Governor is frequently described to be the number one citizen of the state. Article II of the Constitution of Nigeria vests the executive power of the state in the governor and charges him with the execution of state law, alongside the responsibility of appointing state executive, diplomatic, regulatory, and judicial officers subject to the approval of the Assembly members. Oluwafunmilayo Olajumoke Atilade is a Nigerian Jurist and incumbent Chief Judge of Lagos State. She was formerly a judge at the High Court of Lagos State. Attorney General of Lagos state also known as Lagos State Commissioner for Justice is the head of the Lagos State Ministry of Justice. The officer's duty is to ensure that "the laws of the state are uniformly and adequately enforced". The Attorney General carries out the responsibilities of the office through the Ministry of Justice. The Attorney General is appointed to a four-years term, with a maximum of two terms, by the Governor subject to the approval of the State House of Assembly. The incumbent Attorney General is Adeniji Kazeem, Preceded by Ade Ipaye. The Lagos State Judiciary is one of the three co-equal branches of the Lagos State Government organized under the Constitution of Nigeria and laws of the Lagos State government. The Chief Judges are appointed by the Lagos State Governor with the consent of the House of Assembly to serve until the end of their tenure, resigned, impeached and convicted, retire, or die. The Chief Judge of Lagos State is the head of the Lagos State Judiciary, the judicial branch of the Lagos State Government and the chief judge of the High Court of Lagos State. From 1967 to 1973, the title was called Chief Justice of the Supreme Court. The appointment is often made by the Governor. "Section 271(1) of the Constitution provides that ‘The appointment of a person to the office of the Chief Judge of a State shall be made by the Governor of the State on the recommendation of the National Judicial Council, subject to the confirmation of the appointment by the House of Assembly of the State,’". Chief Wole Olanipekun, SAN, OFR is a Nigerian Lawyer and former President of the Nigerian Bar Association and Senior Advocate of Nigeria. Inumidun Akande is a Nigerian Jurist and former Chief Judge of Lagos State. Mahmud Mohammed, CON, OFR is a Nigerian Jurist and former Chief Justice of Nigeria. Chief Kayode Eso, CON, CFR was a Nigerian prominent Jurist and former Justice of the Supreme Court of Nigeria. Nasir Mamman, GCON was a Nigerian Jurist, Galadima of Katsina and former President of the Nigerian courts of appeals. Ayo Salami, OFR is a Nigerian jurist and former President of the Nigerian courts of appeals. Chima Centus Nweze is a Nigerian jurist and Justice of the Supreme Court of Nigeria. Kudirat Motonmori Olatokunbo popularly known as Kudirat Kekere-Ekun is a Nigerian jurist and Justice of the Supreme Court of Nigeria. Lagos State Government is the government of Lagos State, concerned with the administration of the state ministries. The government consists of the executive, legislative and Judiciary. The government is headed by the Governor who is the policy-maker and often assisted by the commissioners and other civil servants of the state. 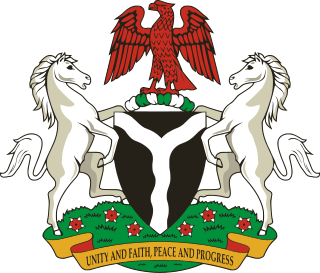 The Cabinet of President Muhammadu Buhari consists of the ministers appointed in the Buhari Administration to take responsibility for each of the government ministries of Nigeria following the 2015 elections. The Chief of Naval Staff is the highest ranking military officer of the Nigerian Navy. The position is often occupied by the most senior commissioned officer appointed by the Commander-in-Chief of the Armed Forces of Nigeria.The Chief of Naval Staff reports to the Chief of Defence Staff, who also reports to the Defence Minister. The Statutory duty of the Officer is to formulate and execute policies towards the highest attainment of National Security and operational competence of the Nigerian Navy. The current Chief of Naval Staff is Ibok Ekwe Ibas who was appointed on July 13, 2015 by President Muhammadu Buhari to succeeded Usman Oyibe Jibrin. ↑ "CJN Asks Court of Appeal Judges to Avoid Conflicting Judgments, Political Associations, Articles - THISDAY LIVE". thisdaylive.com. Retrieved 29 April 2015. ↑ "An Almanac of Contemporary and Comparative Judicial Restatements (ACCJR Supp ..." google.co.uk. Retrieved 29 April 2015. ↑ "12 New Appeal Court Justices Appointed, Articles - THISDAY LIVE". thisdaylive.com. Retrieved 29 April 2015. ↑ "Senate Confirms Zainab Bulkachuwa As Appeal Court President - Channels Television". Channels Television. Retrieved 29 April 2015. This article relating to the law of Nigeria is a stub. You can help Wikipedia by expanding it.